As you may have heard, the world is ending on the 21st. Actually, we're being told that the world is ending by a fringe Christian group in California. The group, Family Christian Radio, is a fundamentalist Christian sect that has spread the doomsday message across the country. Using a confusing, convoluted mathematical formula, a healthy dose of questionable scholarship, and a firm conviction that God prefers the Roman calendar, the group has decided the world will end this Saturday. You can check out more 'doomsday' coverage on Belief Blog. 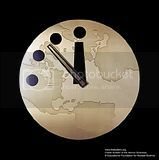 If Family Christian Radio's 2011 prediction turns out to be wrong, have no fear, there is another doomsday close behind. The Mayan's gave special significance to 2012 as the end of this world. So, of course, people have decided to flipout. What is your response to this and other doomsday messages that come along from time to time? Why do you think that people continue to believe in these types of prophecies even when the prognosticators are continually wrong? Join us this Thursday for a conversation about Doomsday, or the lack thereof. We meet at Short's Brewing in downtown Bellaire at 7pm. See you there! IMPORTANT:Only one click is needed.